Intellistage platforms are available in several shapes and sizes. Featuring multiple layer sandwich construction (9mm high-density plywood/7.5 mm honeycomb grid / 4mm high-density plywood) with an aluminum profile on all sides, each platform can supports up to 757 kg. / 1 sq. m. and 157 lbs./sq. Ft (Expo certificate for 757 KGS/sq. Meter). Platforms are available in a grey carpet finish, black textured industrial finish or rugged black Tuffcoat finish and lock together using an integrated platform interlocking system. Steps are necessary on all stages higer than 8" or 20cm. Steps allow performers to quickly and safely get on stage and should be incorporated into all large stage designs. Square platforms are the most common and versatile stage platform as they allow for near endless combinations and stage expansion. Square platforms act as the main building component for most typical stage designs and can be further customized by the addition of Quarter Round and Triangle platforms. 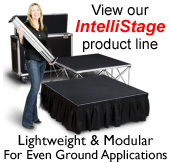 Our Folding Stage platforms offer the perfect solution to cut down on size for transportation and storage purposes. When fully expanded folding platforms are identical in size to our standard platforms and are compatible with their non-folding counterparts. 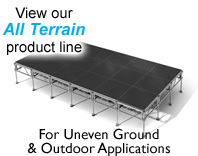 Available in 4x4ft and 1x1 meter platforms. Risers for equilateral Triangle platforms are prefect for Y-shaped stages and runway configurations. Quarter Round platforms are capable of producing round circles 6FT, 8FT or 2 Meters in diameter. They are also ideal to use for creating rounded stage configurations. Rounded corners are ideal for catwalk / runway ends and stage corners as they present a smooth and professional stage appearance. Half platforms cut down on size for transportation and storage purposes. When fully assembled they are identical in height and are compatible with full sized 1M x1M platforms. Half platforms can also be used to make custom shaped and sized stages. Available in a 1M x .5M size. Rectangle platforms are twice the size of regular square platforms and are intended for large stages. Rectangleular platforms require more space for transportation, but also reduce the total number of platforms required for your stage. Rectangular platforms are compatable with all other Intellistage platforms.